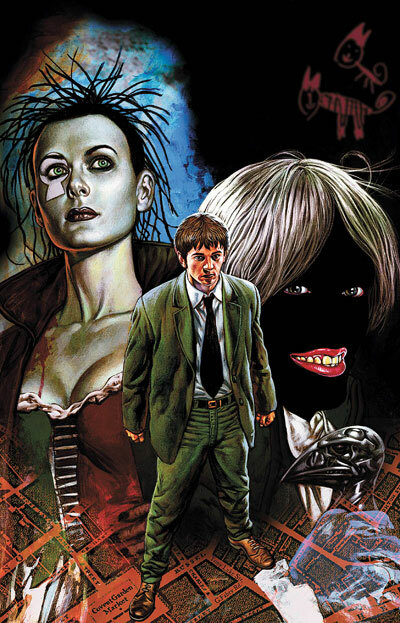 In Melbourne a few months ago I was rummaging around in a comic book store and found a graphic novel adaptation of Neil Gaiman’s book Neverwhere, which I had always intended to read. 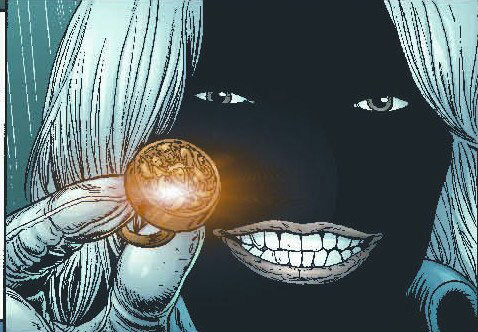 The adaptation is written by Mike Carey and beautifully illustrated by Glenn Fabry. It’s a fantastic story and the adaptation to the graphic novel form is awesome. I’d suggest that picking up the mini-series, book, this graphic novel or hanging out for the new BBC radio series is a very good idea. My review is about the graphic novel though, so follow me under the jump for the story of Richard Mayhew and a mysterious girl called Door. 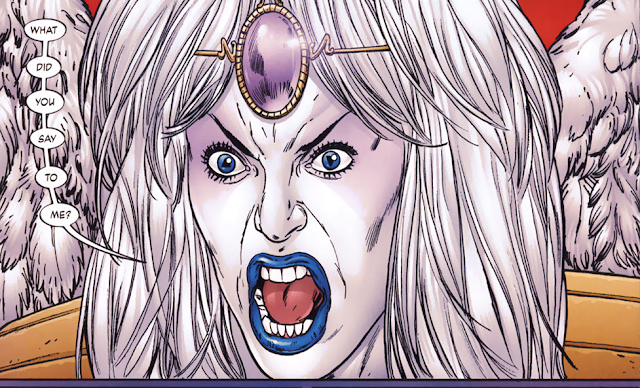 First of all, Gaiman has created a slew of weird and wonderful characters in this world and Glenn Fabry did an exceptional job at capturing their quirks and their heart. I thoroughly loved all of his illustrations; they brought these characters and this world to life for me in a way I am not sure I could have imagined. Door is an exceptionally beautiful creation. Hunter and The Marquis De Carabas blow my mind every time I look at them. That Fabry has been able to create masterpieces of these characters from descriptions in the novel is astounding. Door is the last surviving member of House Portico, a family of openers. This means that Door and her family have the ability to open portals to wherever they want to go, a talent that has not only put her family in danger, but has resulted in her current situation. She is being hunted by a couple of expert assassins who relish in torture; Mr. Croup and Mr. Vandemar and her family has been murdered. Door is part of London Underground, a hidden world below London where nothing is as it might seem to a top dweller. Enter Richard Mayhew an average fellow, overworked, underappreciated, has terror of a girlfriend and doesn’t really have a spine. Door, on the run and injured, transported herself to topside London and in a moment one might call out of character for Richard Mayhew, he brings her home and helps her to recover. This is when Richard’s whole life changes. Door thanks him for his help and asks him to deliver a message to the mysterious Marquis De Carabas who takes Richard to London Underground. Once he returns from his journey, Richard finds that he can no longer be seen or heard by those in London Above. It’s as if he never existed. To rectify this, Richard seeks out those who might know and be able to help in London Underground, and his adventure begins. Who killed Door’s family and why? How will Richard ever get home? That’s the spoiler free section, but below, I’m going to go into spoilers. I want to tell you 5 things I absolutely loved about this story. What a strange and wonderful concept; that all of the things lost from London become this underground world of moving markets, terrifying creatures, rat speakers, lost identities and bridges that take a price. 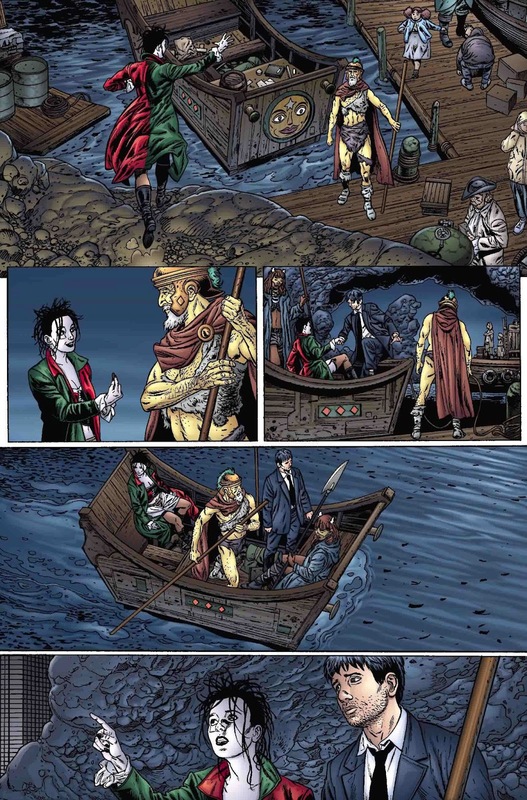 While Fabry and Carey have done their best to capture this world in a graphic novel, I am sure that it still pales when compared to the complex world that Gaiman has created in his novel. Nonetheless, the pair has done an exceptional job of capturing all of the weirdness, the wonderful concepts and characters, the colour, the vibe the kind of hidden lost world that Neil Gaiman dreamed up. It makes sense that Richard cannot make heads or tails of it as we barely can ourselves, but there is still something familiar about it that keeps us engaged and wholeheartedly falling in love with this place. 2. The Quest: Who Killed Door’s Family and Why? The plot itself revolves around Door’s family who were slaughtered and her quest to discover why and by whom. Presumably the same people who have sent Coup and Vandemar after her are behind her family’s demise. Door is an Opener from a family of Openers. They have the ability to open doors to places that no one else can go. On her journey, Door returns to her house and discovers a video diary made by her father. The video tells her to seek out the Angel Islington for help. It is later revealed that the tape was a forgery, the real message being to never go to Islington as the Angel is behind the murders. The motivation, it turns out, is that Islington wants to get back into heaven and only Door can open the portal to get him there. There are complications of course, there are trials and a key that they need to open the door, but only an Opener can truly use the power. It’s an interesting concept and certainly one that I didn’t see coming. Door refuses, based on the fact that Islington is a complete psychopath and sends Islington, Coup and Vandemar into a space as far away as her mind can fathom after swapping the key out and pretending she was opening the door to Heaven. 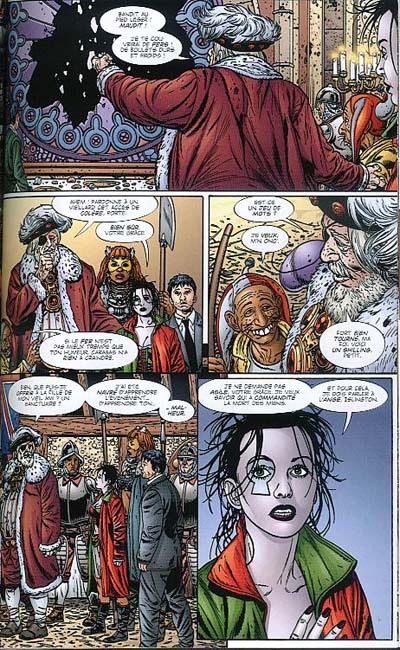 I read somewhere that Neil Gaiman put a little bit of his version of The Doctor into The Marquis De Carabas and I can definitely see it in the graphic novel. The Marquis is a darker version of The Doctor though, extremely intelligent but also seemingly with some missing scruples. Fabry has illustrated him superbly in blue Victorian wear with a black missing face and bright eyes and lips. His hair is a tangle of white and his mannerisms are elegant and lithe. The Marquis is a difficult character to get a read on. Sometimes he seems a friend and sometimes a foe, but he is a man of his word and goes to great lengths to keep it. At the climax of his story, at first I believed he might have been the traitor selling Door and her companions out to Coup and Vandemar but then he is captured and tortured to death; graphically and horrifically. Watching his limp and bloodied body sail through a sea of sewer water, fished out and carted to the market to be sold to the highest bidder I was convinced that not only was he dead but that he wasn’t the terrible person I had thought he could be a moment ago. Luckily, the Marquis never intended on staying dead and had a plan to be revived and a reason for enduring the pain and humiliation of his death in the first place. It adds richness to his character and questions about his past and his connection to Door. I would actually love to read the novel to find out more about him, spend more time with him and find out more about his past and his motivations. I would be willing to say he is my favourite character of the graphic novel. You know I love stories with female characters that I can identify with who are well constructed and awesome. Gaiman gives us a couple of corkers in this story; Door and Hunter. Door is brave, vulnerable and intelligent in her quest to avenge her family’s murder. She exudes both a youthful joy and a calculated wisdom. Glenn Fabry truly brings her to life in his artistic rendering; strange and beautiful with pale skin, wild hair and eccentric clothing. She seems half royalty and half like she stumbled out of a circus tent. Door doesn’t always make the best choices but she certainly makes honest ones and she grows considerably throughout the course of the story. The possibility of her and Richard finding happiness with one another is engaging because Gaiman and Carey do not make romance the central aspect of the story; they make the choices of these two characters through friendship lead to a logical and organic relationship developing, one that even the characters themselves aren’t quite sure of. Hunter’s story is fantastic. A strong built woman with grace and brutality in her movements, Hunter has an allure to her as well. I never suspected that she was double crossing Door and her companions but it made sense when it was revealed. Hunter is intelligent enough to get by in a topsy-turvy world. She’s never really had friends or anyone to rely on but herself. 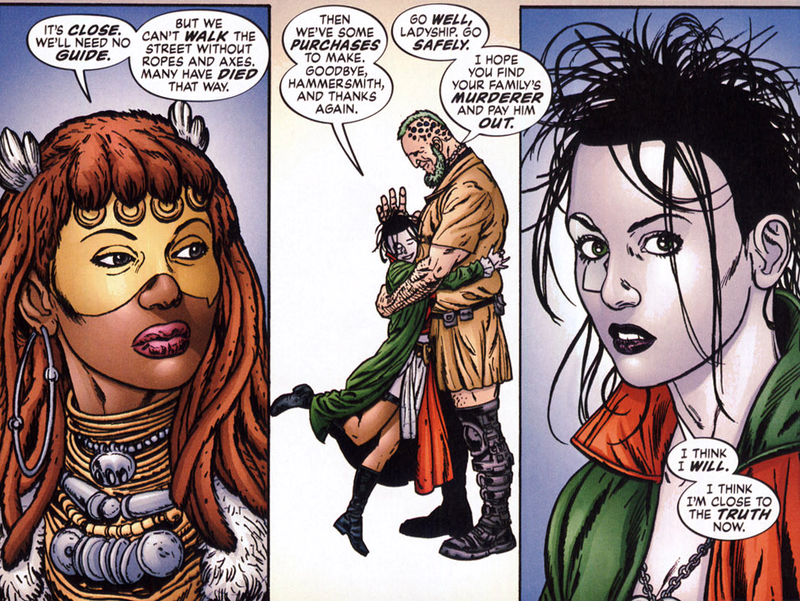 Making her an addict to hunting is also a genius move and it’s quite different to other motivations that Gaiman could have used; money, revenge etc. Ultimately, Hunter isn’t a bad person and she sacrifices what is left of her life to save Richard and the Marquis from a terrible beast. Again Fabry’s artwork is amazing. This was always going to be the way, Richard Mayhew was going to get his life in London back, his boring job and his nasty girlfriend and then wonder why he ever wanted it. As predictable as it was, it was still lovely and well executed. I love a story that isn’t driven by a romantic arc, even if the arc seems to be there. Door and Richard certainly have chemistry, but their story as we see it is one of adventure and self discovery, not a sappy romance. This means that the reader isn’t pressured to buy into their relationship in order to enjoy their quest and their characters. Richard returning to London Underground is both for himself and his own future as well as potentially to seek out a relationship with Door. It’s irrelevant whether this relationship sparks or works out in the end, it’s just nice to see that Richard is making decisions for himself, learning and growing as a character and that his and Door’s story isn’t over yet. Interestingly, a radio version with an all star cast will be produced by the BBC and it is well and truly on my list of things to listen to. Featuring James McAvoy as Richard Mayhew, Natalie Dormer as Door, David Harwood as the Marquis, Sophie Okonedo as Hunter, Benedict Cumberbatch as Islington, Anthony Head as Coup, Bernard Cribbins as Old Bailey and Christopher Lee even makes an appearance! The only way this could be better is if this was a movie cast. I think James McAvoy and Natalie Dormer are perfect choices. I am surprised that Benedict is not playing the Marquis. I guess he will also make a great Islington. Anthony Head as Coup is going to make peoples skins crawl right off. Bernard Cribbins as Old Bailey will be a hoot and Sophie Okonedo will tear Hunter apart! I am excited! It was a great read and I am really glad I picked this one up. I hope you enjoy it as much as I did.